Dedication to the public health service and medical research mark the career of Dr. Charles Armstrong. A graduate of Mount Union College in 1910, Dr. Armstrong pursued his medical studies at Johns Hopkins University and Yale Medical School. Beginning his career in public health with duty on Ellis Island in 1916, Dr. Armstrong was medical officer in charge of the U.S.S. Seneca in 1917 and 1918. However, he was called back to the United States to assist in the investigation of the deadly influenza pandemic. In 1919 and 1920 he served as Epidemiological Aide to the State Department of Health in Ohio and worked at the Hygienic Laboratory in Washington D.C. in 1921. Ultimately, Dr. Armstrong served at the National Institute of Health in Bethesda, Maryland as a research worker from 1921 until his retirement in 1950. For the last nine years, he served as Chief of the Division of Infectious Diseases. From his retirement in 1950 to 1963, Dr. Armstrong continued at the Institute, doing daily research without compensation. ​Dr. 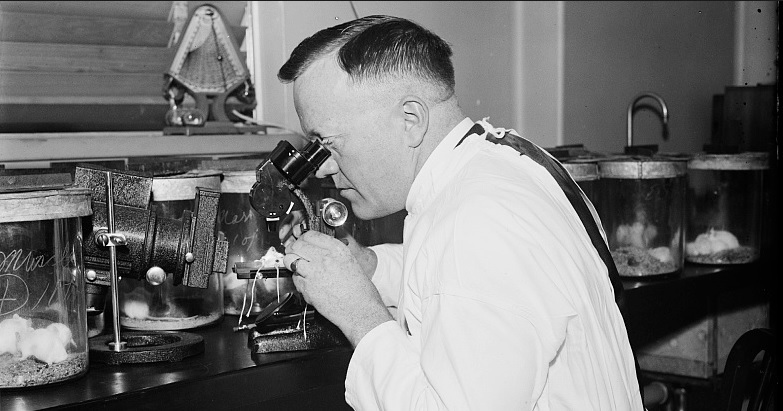 Armstrong may be best known for his advances in polio research. In 1939 he successfully adapted and transmitted, for the first time, a human strain of poliomyelitis virus from monkeys to mice. He was also recognized world-wide for his discovery in 1934 of the virus that is the agent in a clinical entity, which he named lymphocytic choriomeningitis. During his many years of research, Dr. Armstrong himself contracted many of the infectious diseases that he was studying including malaria, dengue fever, psittacosis, choriomeningitis-encephalitis, Q fever, and tularemia. Not only was Dr. Armstrong a victim of psittacosis, aka Parrot Fever, he is credited with eliminating the disease. Among the honors bestowed upon Dr. Armstrong are election to the Academy of Sciences, the Sedgwick Memorial Gold Medal awarded for distinguished work in Public Health, and election to the Polio Hall of Fame at Warm Springs, Georgia. In 1966, he received a letter of congratulations from President Lyndon Johnson on his 80th birthday. Dr. Armstrong was married to Elizabeth Alberta Rich from 1920 until his death on June 23, 1967. They had one daughter named Mary Emma Armstrong who, in 1972, donated Dr. Armstrong’s papers to the National Library of Medicine.